Over the last few days I've been working on the Phebe project. 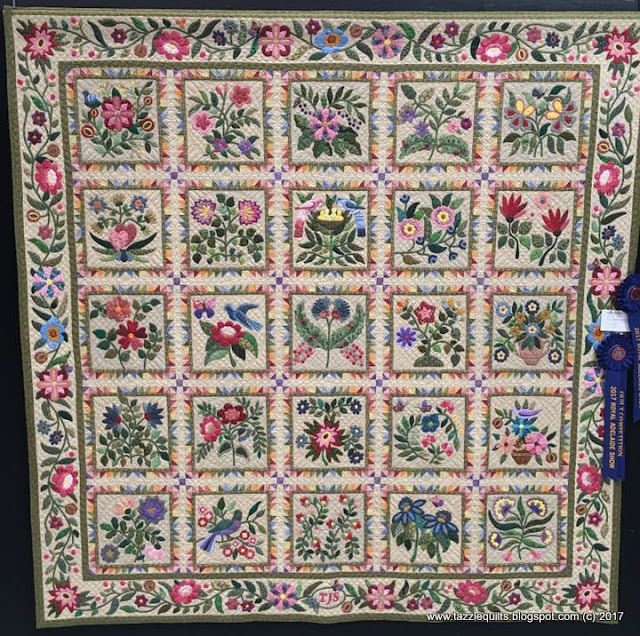 If you've not in the know, it's a delightful quilt made by Di Ford-Hall, a reproduction of a gorgeous vintage applique quilt. I'm having a hard time working on the HOQH blocks, and I have this feeling I'm in danger of Phebe bullying it's way to being the ONLY thing I want to work on. This happens to me A LOT!! I'm going to make sure I keep everything separated in containers - there are so many tiny shapes to cut out, it will be so easy to lose them! In the middle containers are tiny scrappy squares, and little light fabric triangles - I'm weeding through the smallest of scraps to find cute ones that will work in the quilt. 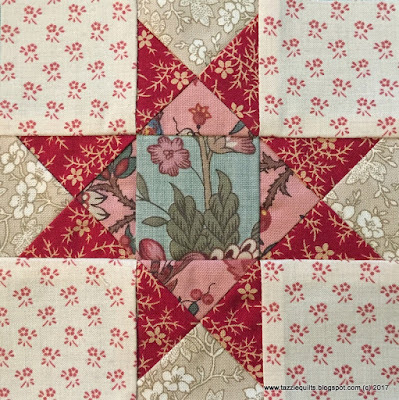 Though the stars and pieced border will have a bazillion different fabrics, the applique and the sawtooth borders will have a consistent fabric - I think it will give the eye somewhere to rest. 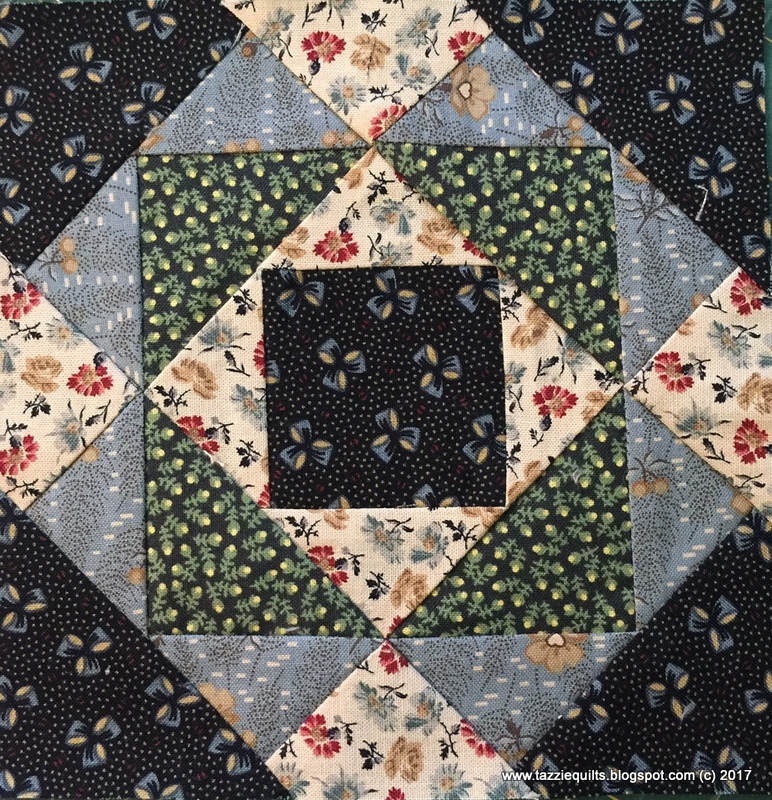 And I'm looking forward to starting work on the applique center block, but after so much applique in the Caswell quilt, I'm just not quite ready to start ... soon though, I feel it will be soon! Isn't it just the most gorgeous print? And there was another one that was all Nutcrackers ... I feel like that will have to be mine too. No idea what I'll be doing with it, but when has that ever stopped me? This week I managed to get two of my HOQH blocks put together, yay! Two blocks doesn't seem like much to have gotten done, but I also finished the last of the 'kitty savers'. I ended up having to make eight of the lounge protectors ... I didn't think they'd be required for the back of the lounge where it's against the wall, but apparently no part of the upholstery is sacred to that darned cat! 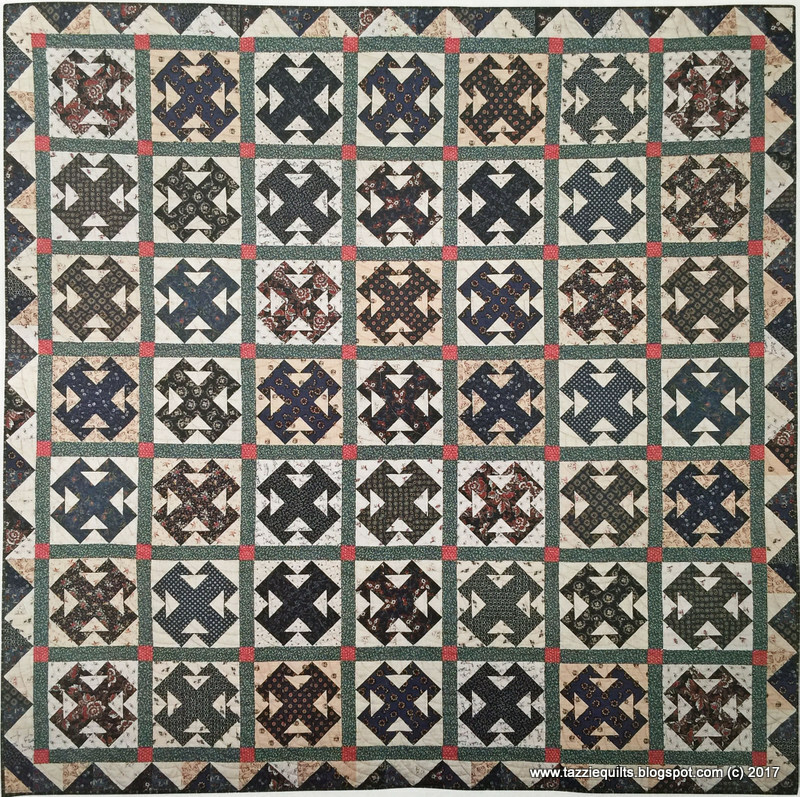 There are so many 1" finished half square triangles in this quilt, I'm really getting a lot of practice. 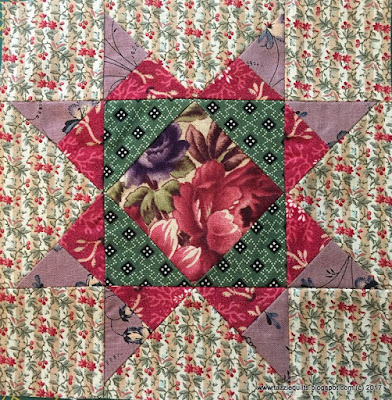 The green fabric in the corner squares is one of my absolute favourites. 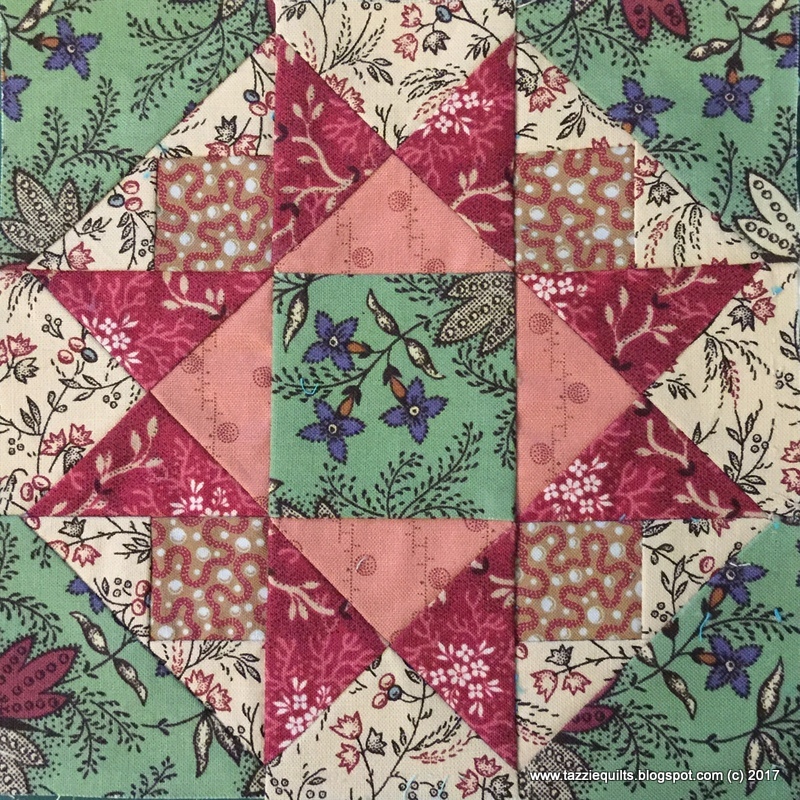 I love how this block turned out - and it may be because there's a whole lot of my favourite green fabric in it! Does anyone know what collection the green is from? I only have a little bit left and I'm afraid the selvedge is long gone. It would be fun to hunt some more down. Is't getting late here now, but I'm spending a little time in my sewing room tonight - I'm going to dig into my scraps some more and see what I can come up with. Chatter soon! Doesn't that sound lovely? Turning Four-T?? No, I'm not turning 40 again ... but I have been revisiting this project getting the pattern drawn up with diagrams ready for my Etsy store. This is one of my all time favourite projects, made for a special occasion, using some of my most special fabrics. 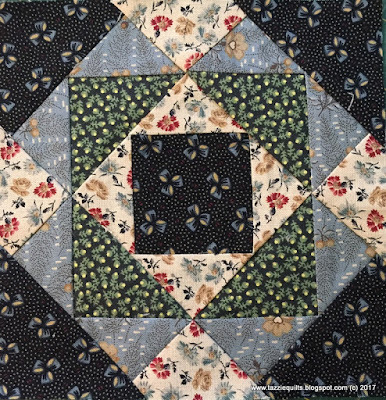 I have a deep and abiding love of conversational prints, and I used nearly all that I had in this quilt - and the blue/navy fabrics are some that were gifted to me by my darling friends and others that I found on my travels in the USA. One thing that always makes me giggle about this project is the name - I love that there are four "T's" turning in each block, and that it was made when I was turning 40. It's the little things in life that keep me amused. 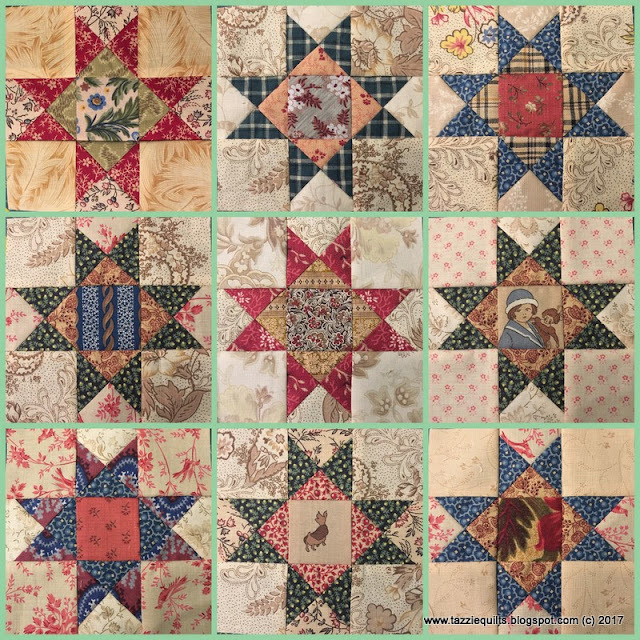 I took the pictures of the blocks super fast, so there are some stray threads in there, and the blocks aren't necessarily straight in the photos, but you can see that I was having fun working through some of the cute scraps I've got laying around. The thing that really made me happy is that all the points are nice and accurate - I only had to make adjustments to a few of them. I'm looking forward to getting some brighter reproductions and cute fussy cuts in there. 80 of these blocks are required, so with these and the one I made the other day, I only have 70 to go! In other news - recently I received a sweet comment from Diane Smith. I wasn't able to respond to her personally as her email address came up 'no reply', but I can address her questions here. First up - I think Diane might be a little confused about my identity - I'm not Lori, but I'm slowly working on one of Lori Smith's beautiful projects - but if I'm to be mixed up with someone, what an honour! 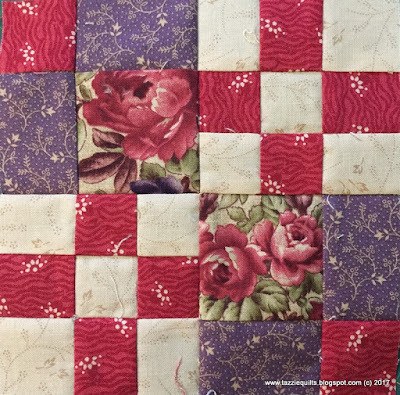 Diane asked me how I select fabrics for my blocks, ie, sticking to collections/reproductions etc. Well, this is a tough question to answer - in that I don't have any magic formula that I follow. If I'm working on a vintage style project, I tend to use vintage style fabrics, but I'm not really super fussy about collections. My main concerns are the value of the fabric - does it read dark, medium or light. Do I like the fabric, and do I think the colours play nicely together. Sometimes I just mix things all together and then select a unifying fabric like sashing to keep it all together. Honestly, the best way to go is just trust your instinct, and use things you like. Diane also asked about my applique technique - I mostly needleturn applique, but for the last project I used the freezer paper on top technique which is demonstrated beautifully on Teresa's blog. I hope this helps Diane, and thank you for commenting. That's it from me today - tomorrow morning I get to pick up my quilt from the show and any ribbons etc that go with her - I'm looking forward to bringing my creation home! My Caswell quilt has done me proud, and won some ribbons at the Royal Adelaide Show. 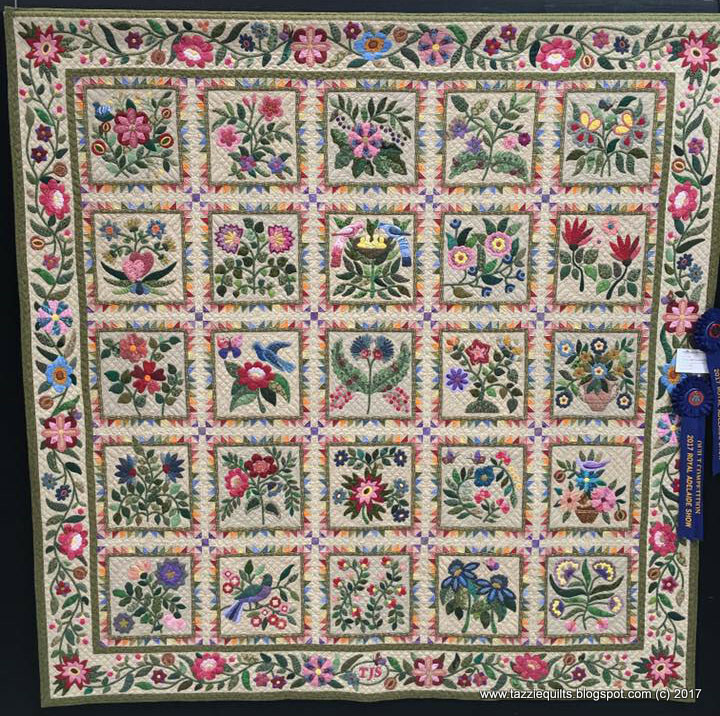 I feel so incredibly blessed - it placed first in its category, was selected as the best quilt in show, and won the prize for the best art/craft exhibit in the show. Oh my goodness, I was gobsmacked when I heard the news. Supremely happy! A big thank you to my sweet friend Lizzy for taking the picture above for me (and to the many other sweet ladies who've done the same) I haven't been able to get to the show yet, but tomorrow is the day we've planned to head over there. I cannot wait! This was a super easy one (in the scheme of this project) - don't forget that the blocks are 6 inches finished! 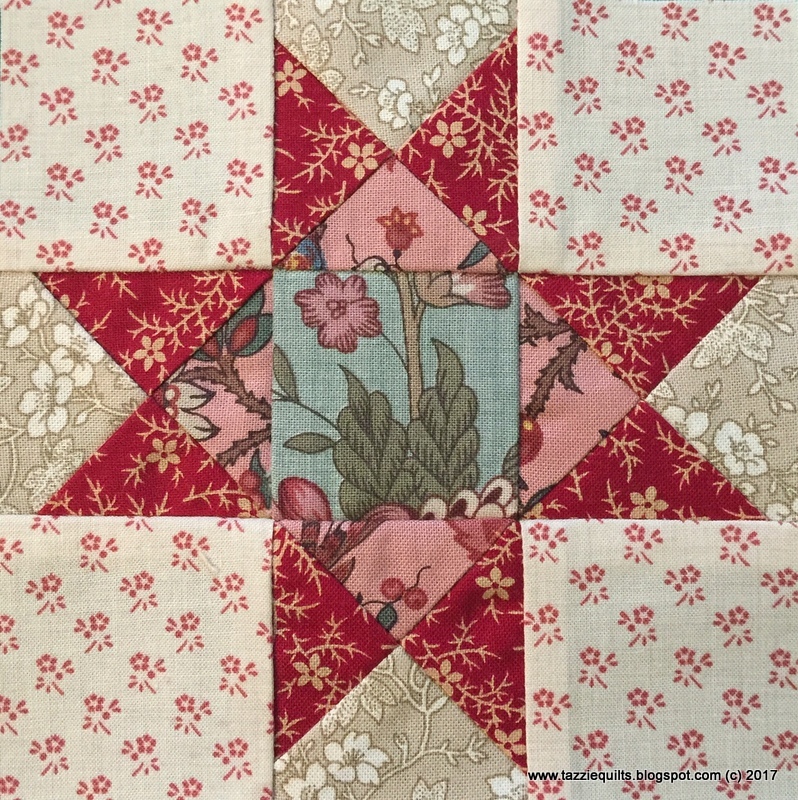 The floral fabric in the large squares is a favourite, I used it in the Caswell quilt on one of the tricker applique blocks as part of a flower and I love how it looked. This block looks kind of wonky in the picture, but all the points are meeting up nicely, so hopefully it'll look just fine when it's sewed into the quilt top. Most of the fabrics in this block were from the 'Donna scraps' again (but not the green print) - I love rummaging through them ... you'll continue to see them in this project ... and also the one I'm just getting geared up for! And I have a feeling that the pink fabric in Block 26 might have been from Donna too! 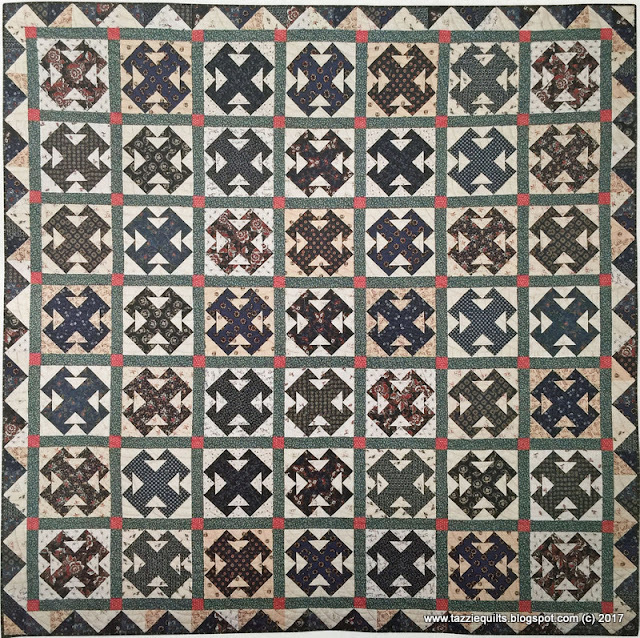 I had pretty much decided even before I finished the last quilt that the next BIG THING I would be working on would be the Phebe Quilt by Di Ford Hall. 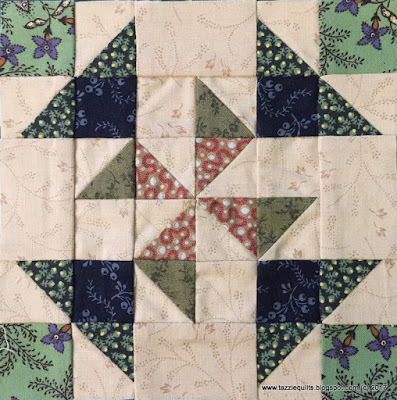 I just love all the things she does, and I simply fell in love with Phebe - possibly because I've been itching for a lot of piecing rather than working on so much applique. Definitely google search on pictures of the quilt - it is just darling. 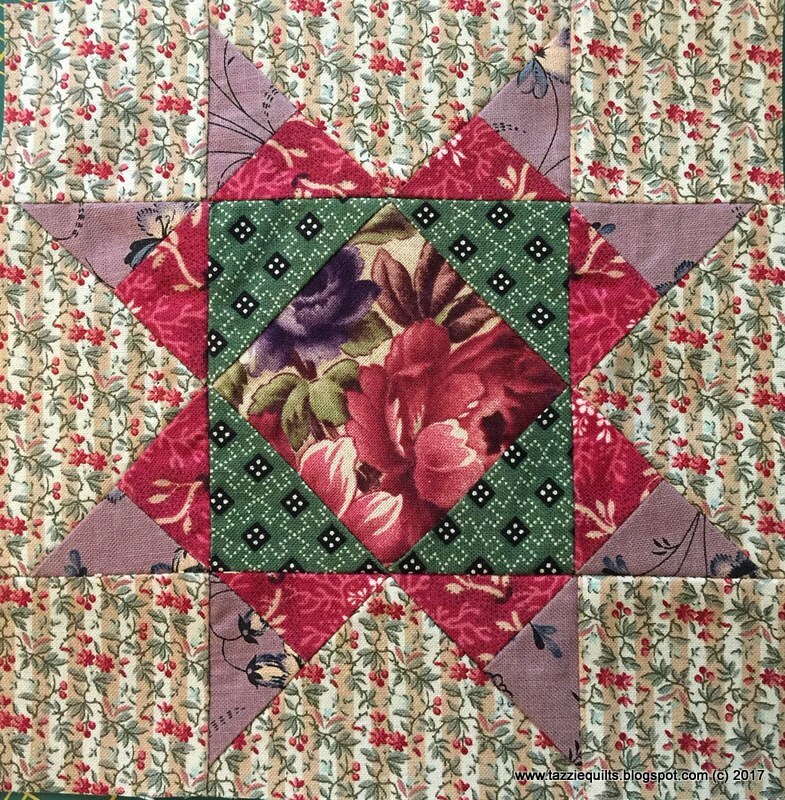 Or, if you go to my Pinterest page and check the Quilts-Di Ford Hall tab, you'll find pictures in there. 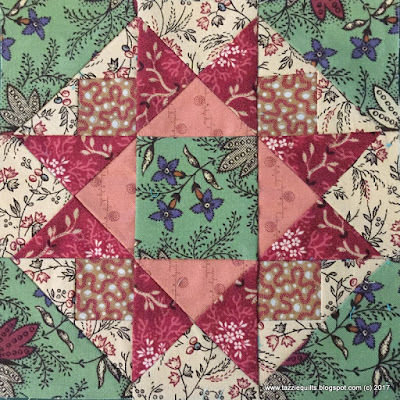 This block is a little cutie, at 4.5" square. You'll see a lot of fabrics in common between this project and the HOQH one, and hopefully from my end I'll see a reduction in the amount of scrap fabrics I have kicking around. Who'd like to place bets that I see no discernable difference at all? 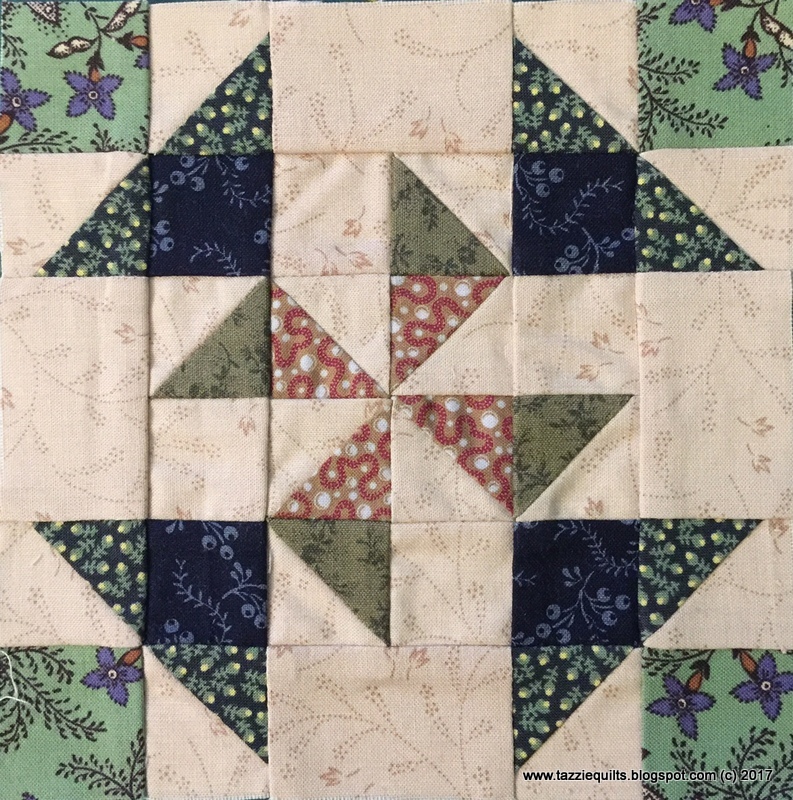 Soon I'm going to get busy working on the applique centre block, but for the moment I'd like to enjoy some fairly easy piecing and have fun selecting pretty fabrics that play together nicely. Isn't this block a little cutie? I really like the fabric and colours. They're all from the scraps gifted to me by my sweet friend Donna. She's such a honey. Let's hope I get a couple more blocks made this afternoon - as the next few days are busy ones too.